Join us to learn more about non-traditional quilt backs like fleece, minky, sheets, and more, and what to look for in sewing room lighting. This episode is brought to you by Ink & Arrow Fabrics and Famore Cutlery! The quilt hanging behind us is Islands in the Stream, from the September / October issue of Modern Patchwork! 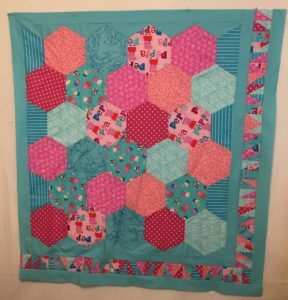 The tutorial for the hexagon pincushion caddy can be found at Penny’s Hands. 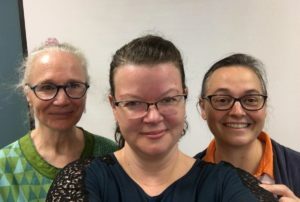 Here’s our selfie with Jane Sassaman! We like this LED clip lamp for task lighting; it fits on a quilting hoop! Pam has the Swan Table Lamp combination daylight / magnifying light on her cutting table. Today’s episode was brought to you by Ink & Arrow Fabrics, because fabric should be fun! Check out their Pixie Dots basics line! 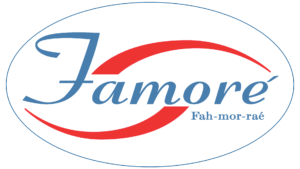 Thanks also to our sponsor Famore Cutlery; learn how to stay sharp with their line of scissors and cutting implements. Our next Virtual Stitch-In is Friday November 10 at 7pm US Eastern. Link for the flexible lighting stop not working. Sending me to a camping light. Looking to get some light for my sewing machines.